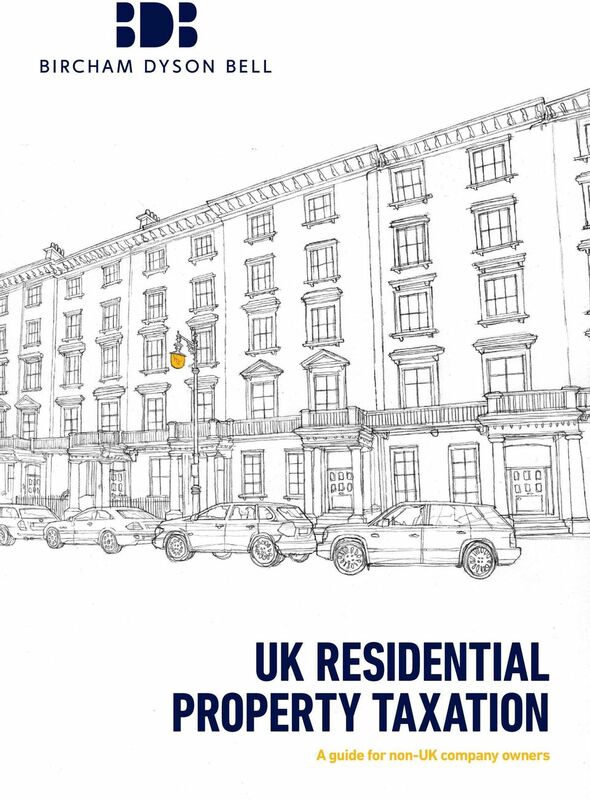 Download "UK RESIDENTIAL PROPERTY TAXATION A guide for non-uk company owners"
2 This publication is not meant as a substitute for advice on particular issues and action should not be taken on the basis of the information in this document alone. This firm is not authorised by the Financial Conduct Authority (the FCA). 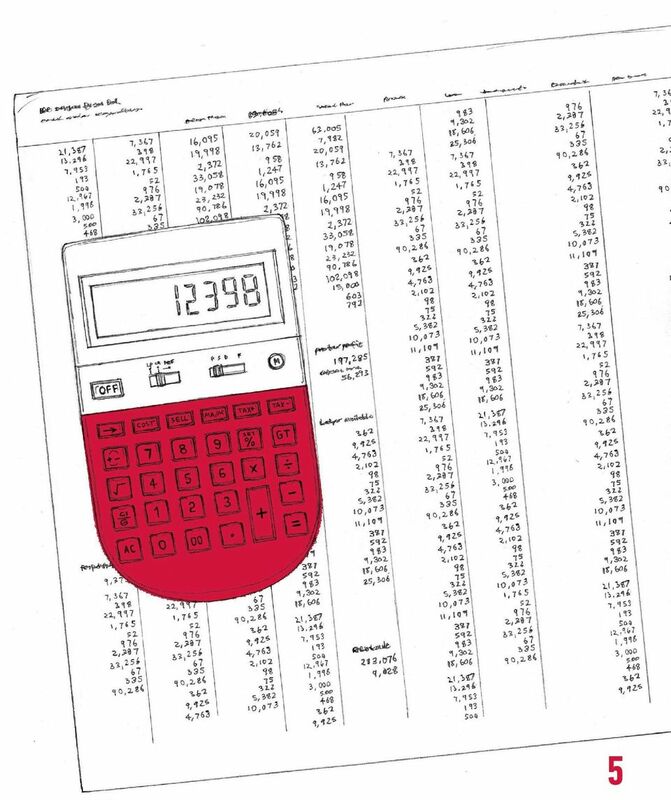 However, we are included on the register maintained by the FCA (www. fca.gov.uk/register) so that we can offer a limited range of investment services (including insurance mediation activities) because we are authorised and regulated by the Solicitors Regulation Authority (the SRA). We can provide these services if they are an incidental part of the professional services we have been engaged to provide. Mechanisms for complaints and redress if something goes wrong are provided through the SRA and the Legal Ombudsman. Bircham Dyson Bell LLP processes your personal data in connection with the operation and marketing of a legal practice and will occasionally send you information relating to the firm. If you would prefer not to receive this information or would like us to amend your contact details and/or mailing preferences, please notify us by Bircham Dyson Bell LLP is a member of Lexwork International, an association of independent law firms. Printed on sustainable paper. 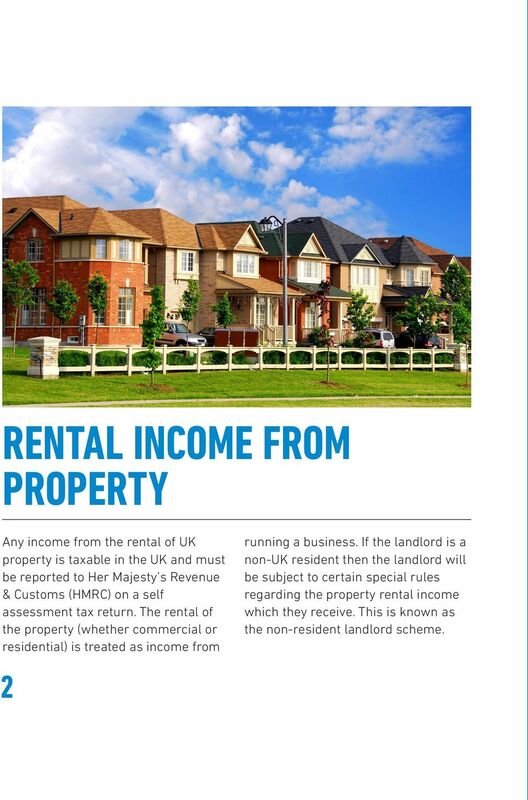 4 RENTAL INCOME FROM PROPERTY Any income from the rental of UK property is taxable in the UK and must be reported to Her Majesty s Revenue & Customs (HMRC) on a self assessment tax return. 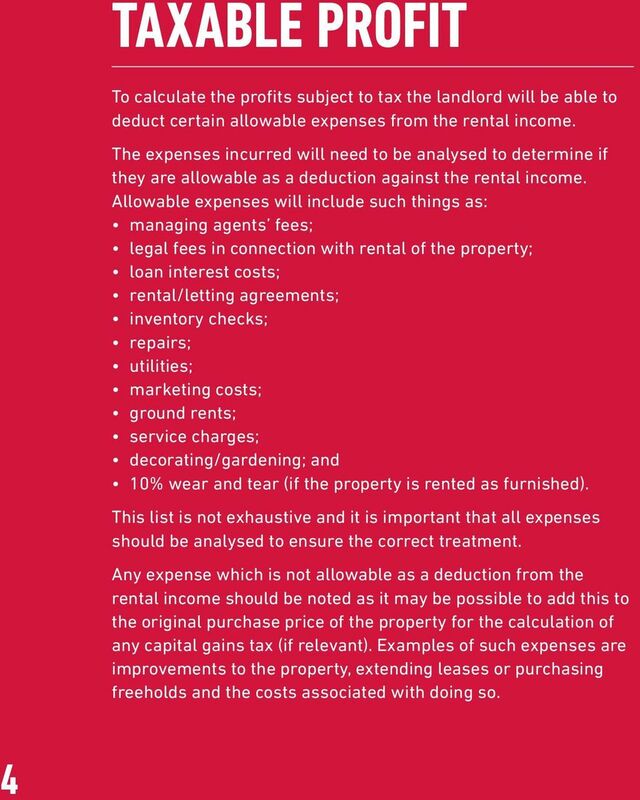 The rental of the property (whether commercial or residential) is treated as income from 2 running a business. 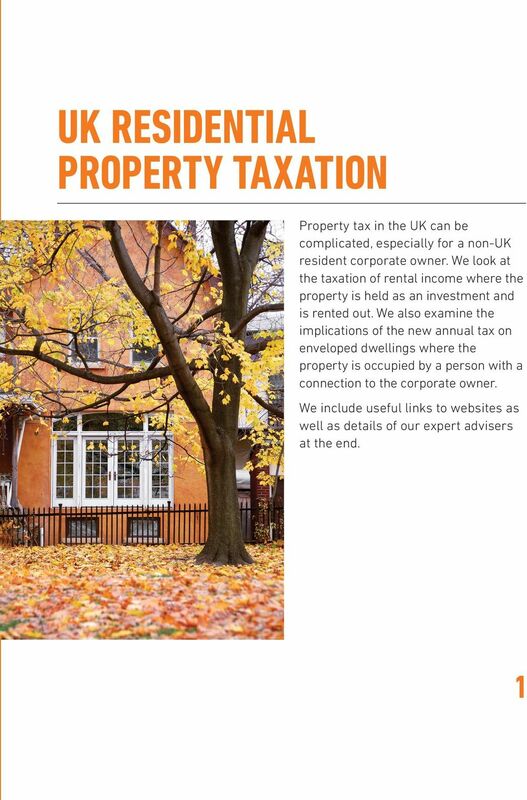 If the landlord is a non-uk resident then the landlord will be subject to certain special rules regarding the property rental income which they receive. 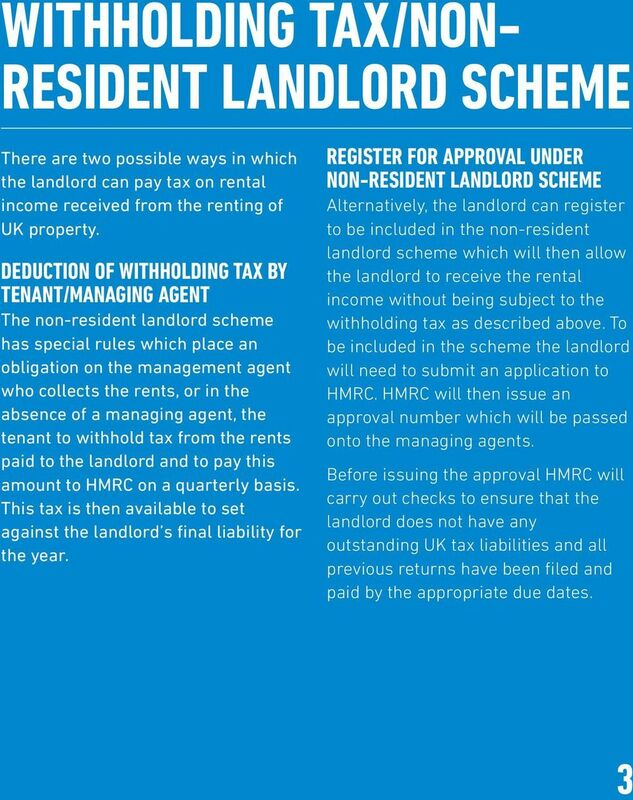 This is known as the non-resident landlord scheme. 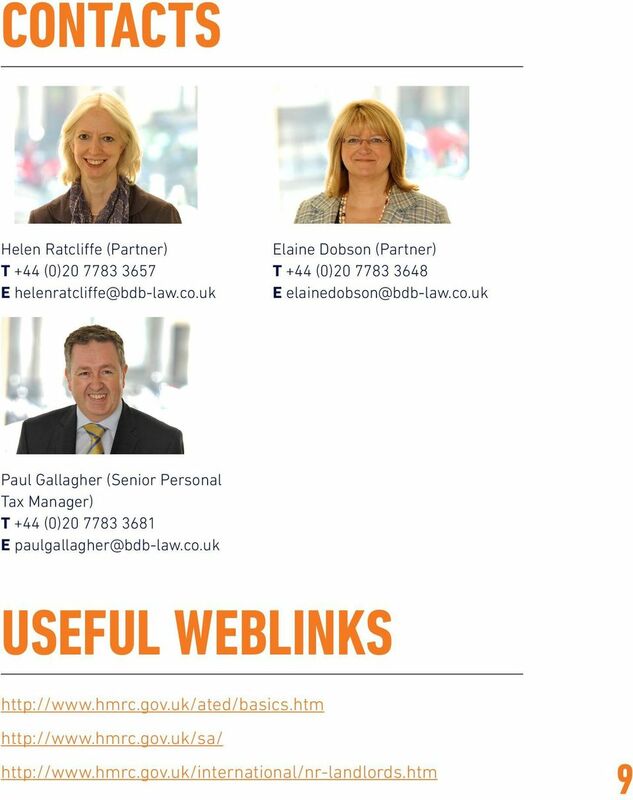 10 HOW WE CAN HELP Dealing with HMRC can be, and often is, a daunting prospect and professional advice should be sought to ensure that the correct details are provided. 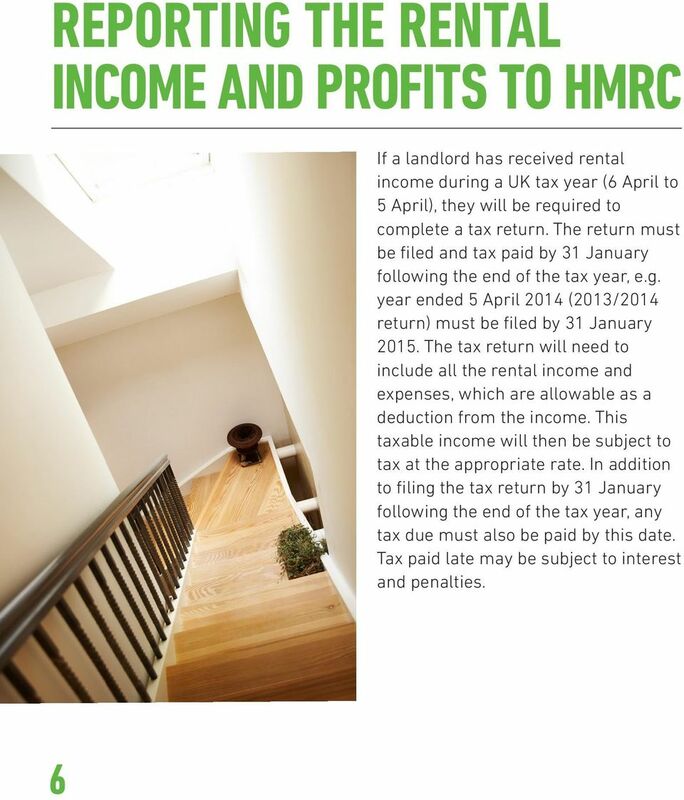 HMRC has recently launched a campaign offering landlords the opportunity to put their tax affairs in order. 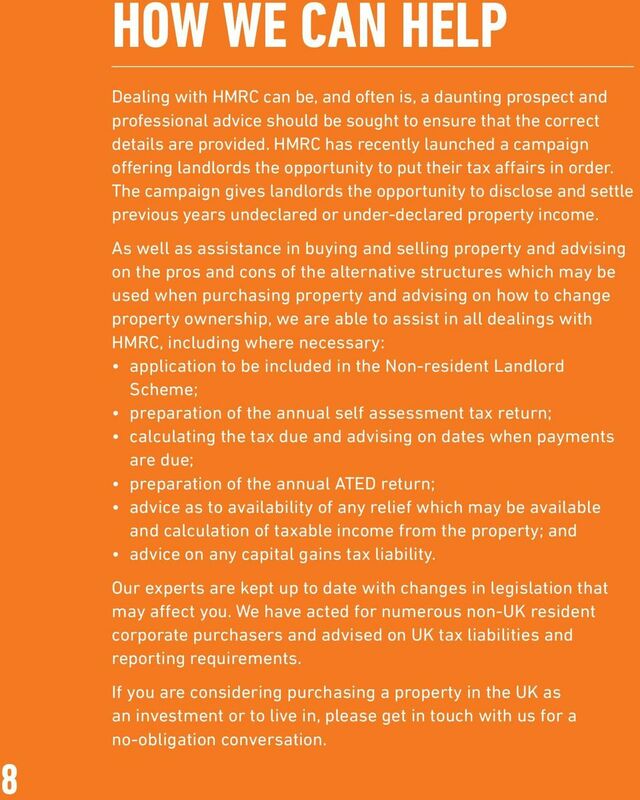 The campaign gives landlords the opportunity to disclose and settle previous years undeclared or under-declared property income. 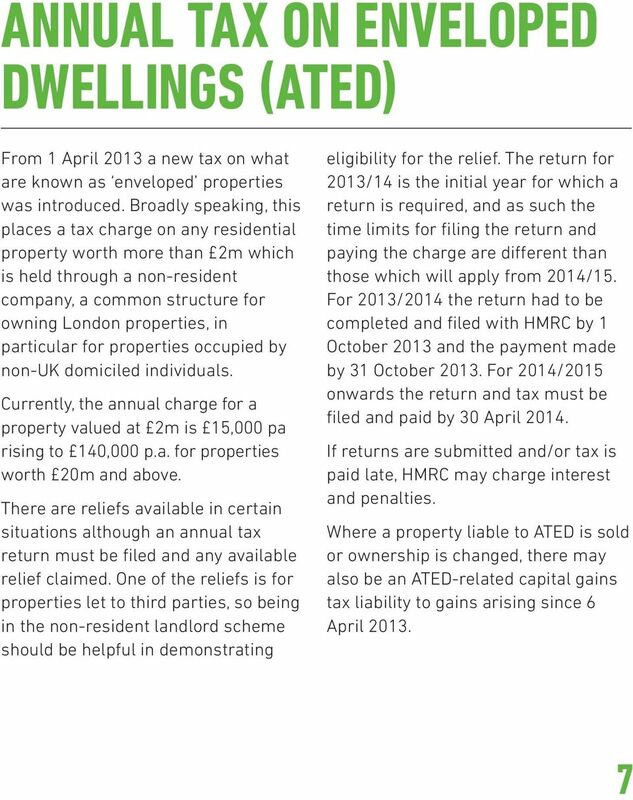 As well as assistance in buying and selling property and advising on the pros and cons of the alternative structures which may be used when purchasing property and advising on how to change property ownership, we are able to assist in all dealings with HMRC, including where necessary: application to be included in the Non-resident Landlord Scheme; preparation of the annual self assessment tax return; calculating the tax due and advising on dates when payments are due; preparation of the annual ATED return; advice as to availability of any relief which may be available and calculation of taxable income from the property; and advice on any capital gains tax liability. Our experts are kept up to date with changes in legislation that may affect you. We have acted for numerous non-uk resident corporate purchasers and advised on UK tax liabilities and reporting requirements. 8 If you are considering purchasing a property in the UK as an investment or to live in, please get in touch with us for a no-obligation conversation. The higher rate threshold will also increase with the basic rate limit set at 32,000 for 2016/17 and 32,400 for 2017/18. I. BASICS OF COLORADO LANDLORD/TENANT LAW A. Statutes: Colorado Security Deposit Act: Colo. Rev. Stat. 1973 38-12-101 to 103 (1982 & Supp. 1990). Step 1: Visit www.gov.im/onlineservices and register for Isle of Man Government online services by selecting Income Tax service.